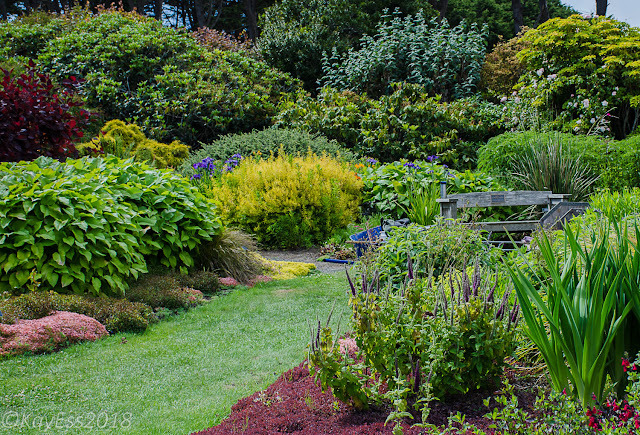 April is the month that the garden moves past the awkward youth phase of spring, and starts to pump out the growth for the season ahead. April has been blissfully cool so far, with much less rain than we experienced in February and March. Rain is on the agenda for today which is okay by me-I was starting to worry that I was going to have to water. I always try to hold off til May . Some years we get occasional rain right through to the end of May, but of course this year remains a mystery til it is done. I have declared the end of frost and this past weekend put away all my protection. 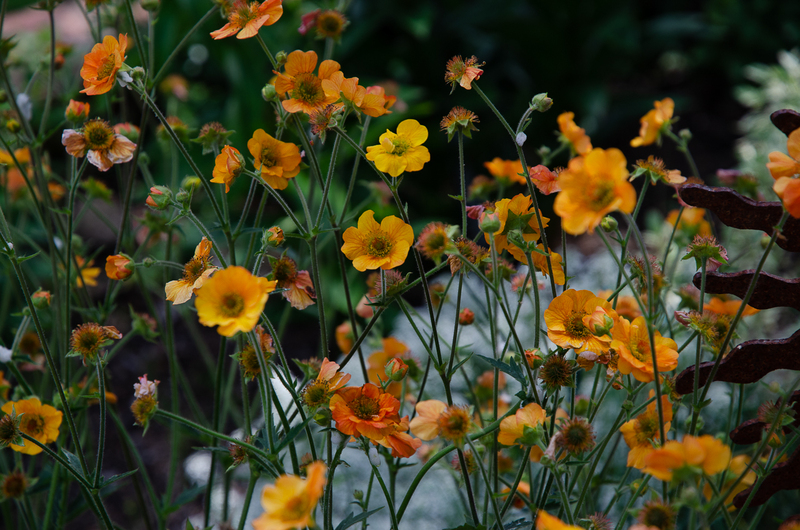 Geum 'Totally Tangerine' powers on. 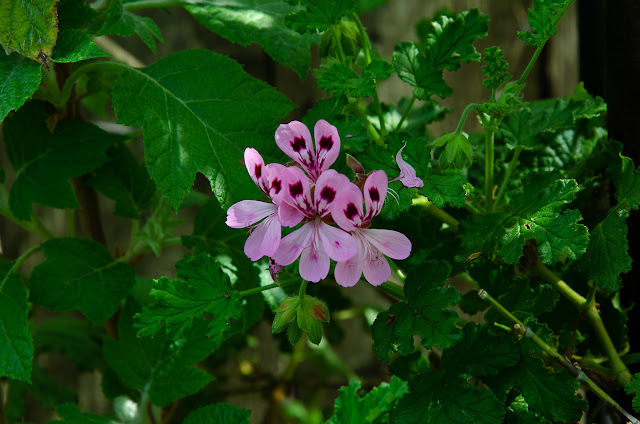 This is one of my scented Pelargoniums. One of the many things I collect. I'm working on a display plan. Right now few of them are being shown to their best advantage. 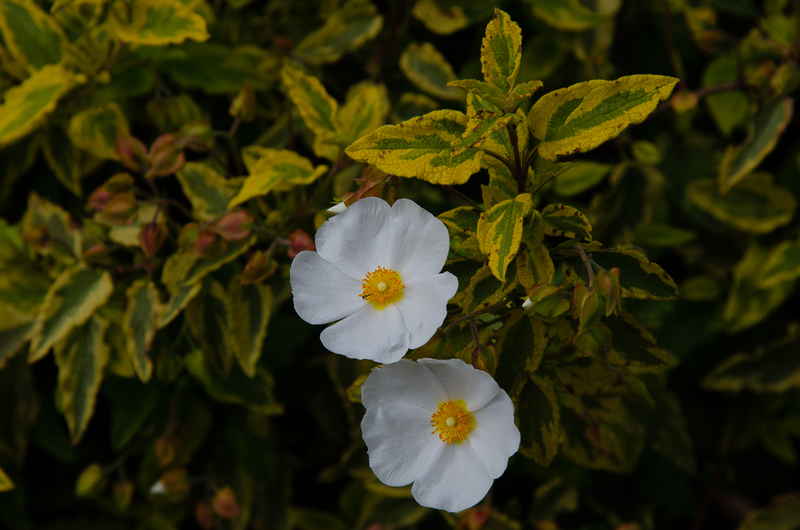 This is miniature climber Jeanne La Joie. 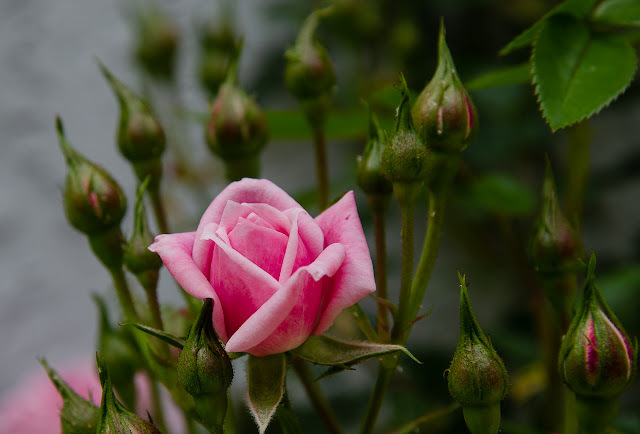 She is one of the few plants that was here when we moved into this house in the early 1990s. I had planned a major renovation pruning for her this winter , but the rain diminished my opportunities. 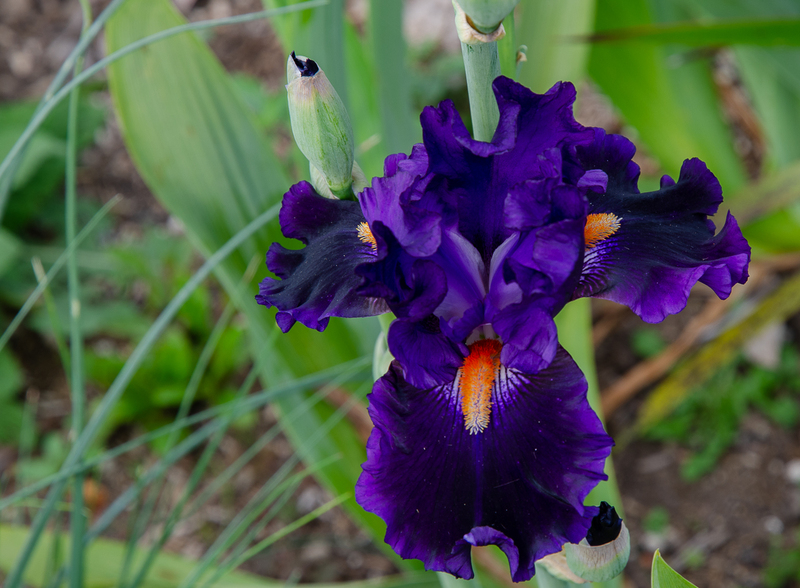 I have had an on-again off-again relationship with bearded Iris. I never didn't love them, but they are so awkward to fit into the garden . I think I have come up with a plan that may allow me to add a few more in a location that would be hidden by summer perennials. 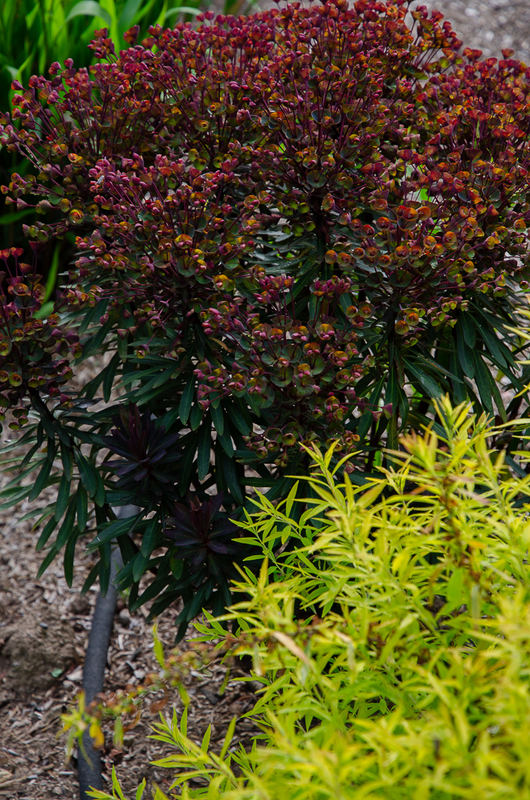 I love my Euphorbia 'Blackie'. It has become hard to find, so when I found them I bought 3. One of them passed on. Not able to find a replacement for 'Blackie' I picked up a small 4" pot of Euphorbia 'Ruby Glow' . This photo is pretty crappy and the plant is still young but the combo of the bright chartreuse flowers and the dark foliage is very promising. This NOID Fuchsia never died back and bloomed all winter. 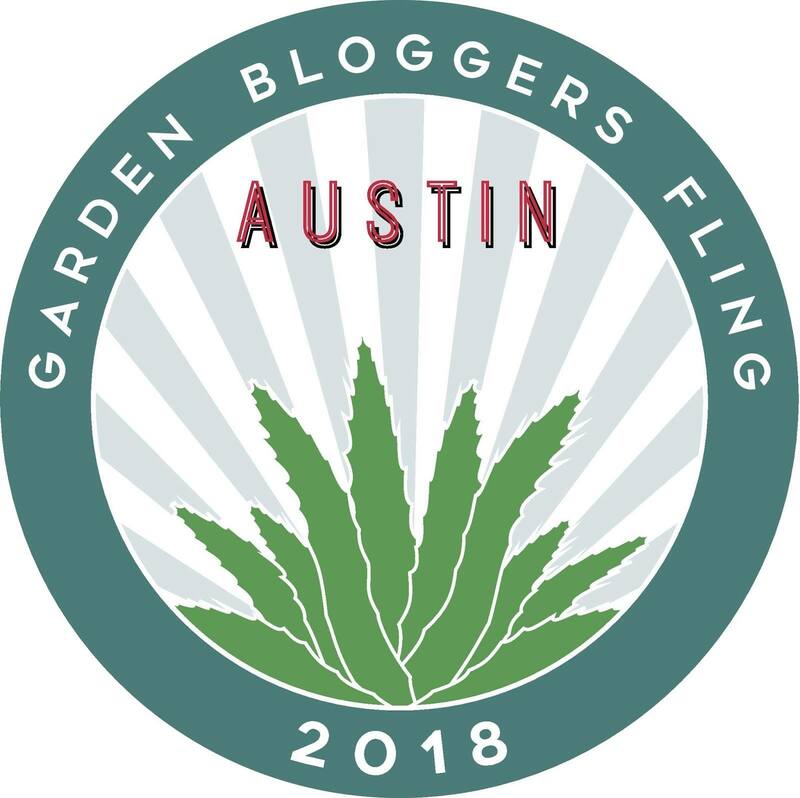 This Columbine was ordered from High Country Gardens last summer-part of Austin Fling swag. It's called 'Swallowtail' and I love the long spurs and sunny color. Weigela variegata ..the bloom is brief but the foliage carrys the display through the summer. 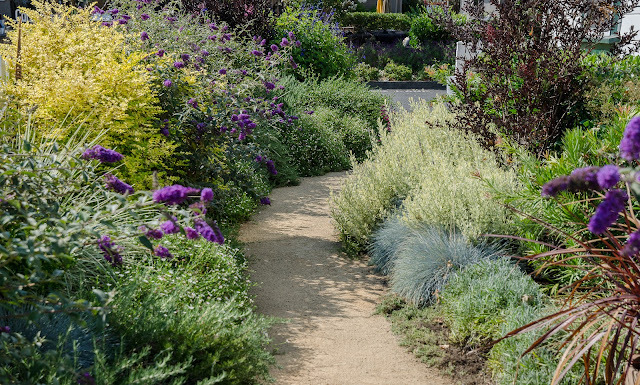 The foliage to the left is the Lavender 'Platinum Blonde' . 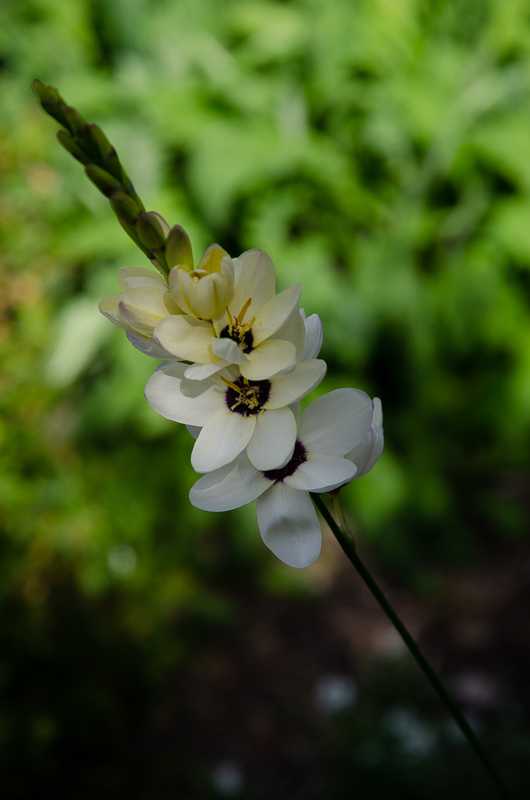 This is species Freesia from Annies Annuals collection of rare plants. It was kind of dud last spring , but I didn't bother to dig it up. I'm not sure they are even offering this anymore but I am enjoying it for what I expect to be a brief interlude. 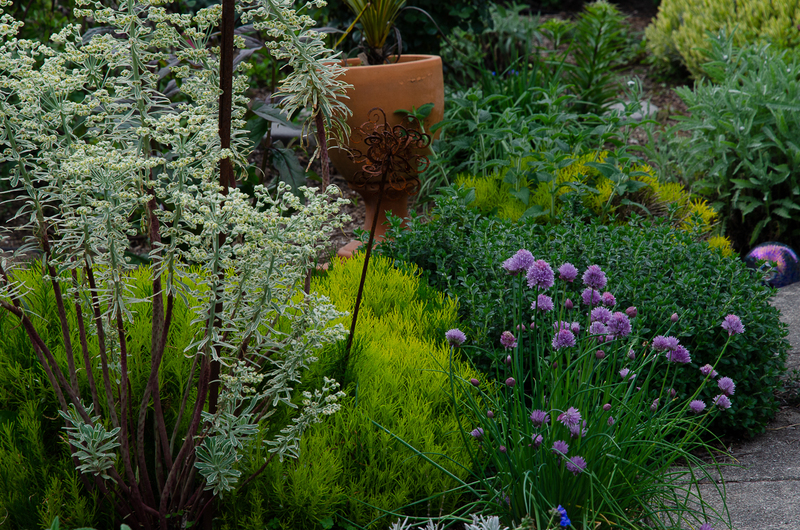 I took this photo to feature the chives blooming on the right, but on the left is the lovely Euphorbia 'Silver Swan' . 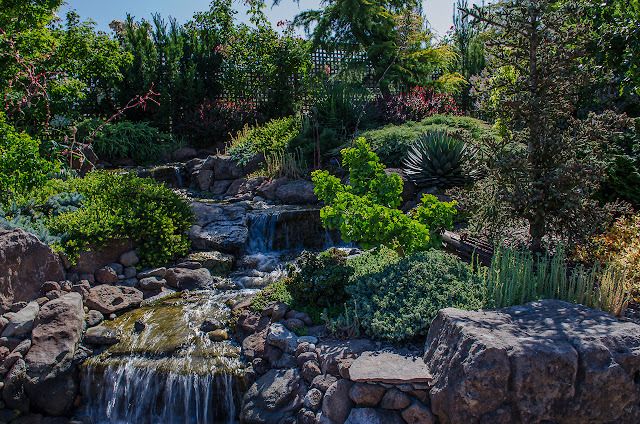 Our hostess Carol at May Dreams Gardens will provide you with blooms from across the nation. I'm pretty sure we're not going to get another frost this spring either. I really need to start hauling my potted plants out of the greenhouse. 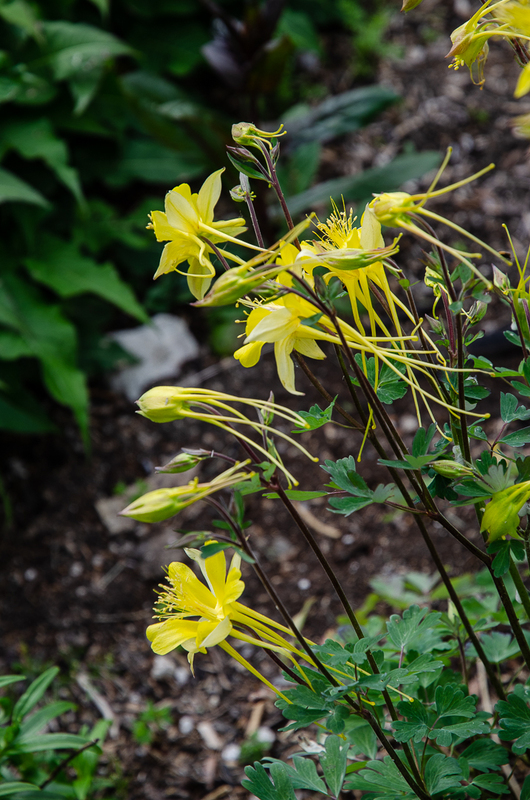 You have some very pretty spring flowers, I love Columbines with long spurs like that. Happy GBBD! now that I've put away all my protection we'll probably have a frost warning.Kind of like washing your car and then it rains ! You make Geum 'Totally Tangerine' look so good! I am also impressed with your dark Euphorbia, I can't ever get them to look like much. I bought second Geum in fall-that's how good it is. 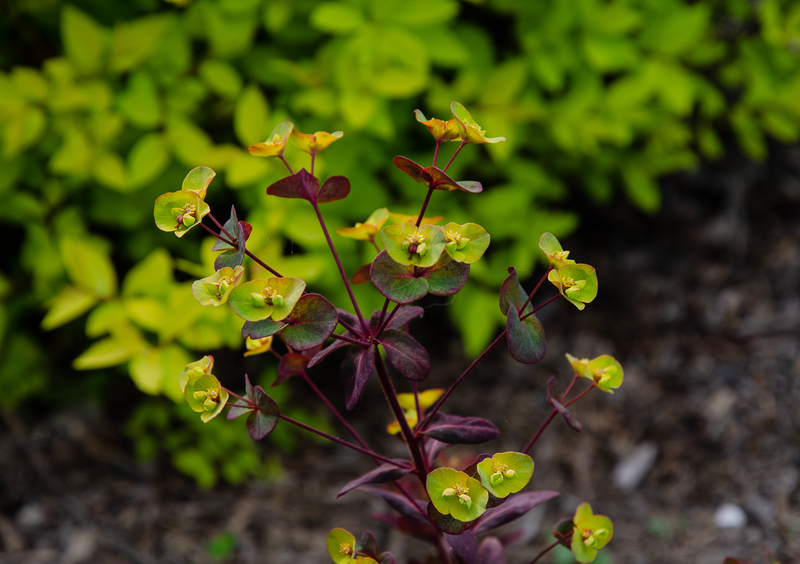 "Blackie' is one of the best Euphorbias I've grown , but I will get three years out of it at most. Hopefully I can find it again when these bite the dust. I love 'Silver Swan', not that I need another Euphorbia. Even though we were lucky in the rain department this year, I envy you your continuing showers. The last several storms have passed us by, my collected rainwater is already running out, and the temperatures are already getting quite warm. Silver Swan has been a really good white Euph. I've had Tasmanian Tiger too, but the Silver Swan seems longer lived.It's raining as we speak, but looks like it's be 1/4 inch tops. We're heading for 80 degree land later this week. Fuchsia is my favorite! I love that Swallowtail Columbine! So cool! 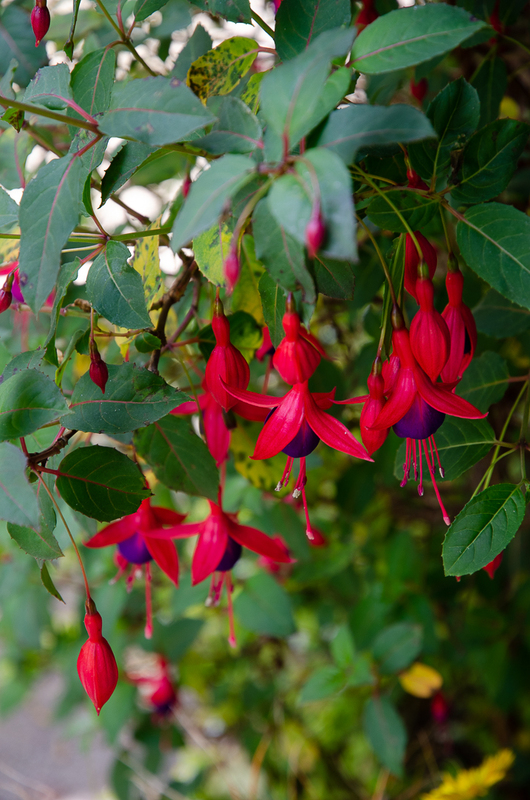 I'm very attached to my Fuchsias. They had an easy winter this year ! 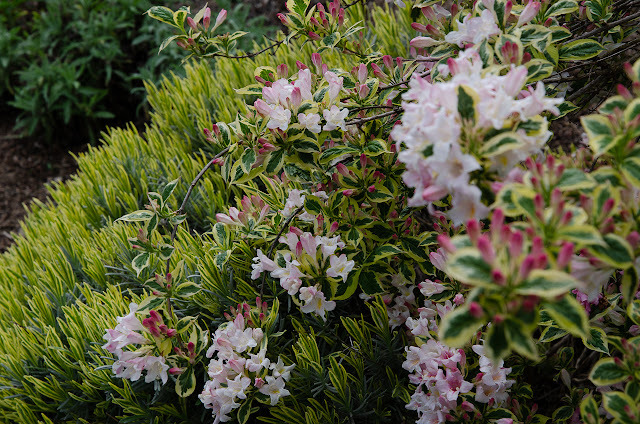 Those shrubby Euphorbs seem to do great for you. Do they get really ratty looking once the summer heat arrives? Here they just die. My one attempt at Geum--the darn thing GREW great, but in 4 years I never got even one flower and I threw it out. Your 'Totally Tangerine' tempts me to try again. E. Ascot Rainbow can get a tad ratty , but I confess that I just toss em into the compost and get another one. 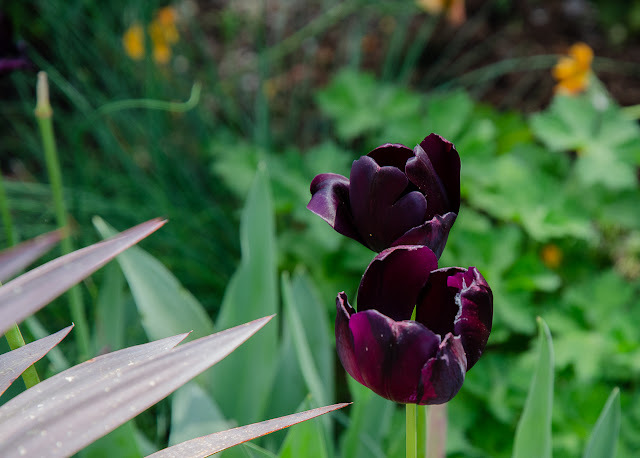 Blackie and Silver Swan hold up really well in summer. I think it's a fine line in our hot summers with Geum and too much or not enough sun. I always though of them as a shade plant, but I now give them direct morning and and shade in the afternoon. Gorgeous blooms! Ain't spring grand? grand and here at last ! A short bloom time but very enjoyable while they last. Totally Tangerine has been a stellar performer here too. Last fall I moved some it to a sunnier spot in one of the new back gardens. It will be interesting to see if it does much better. hopefully it's of no interest to bears or the hooved minions !